Monday through Sunday, 11 a.m.-9 p.m. The Jolly Roger is Ocracoke island’s premiere and most authentic waterfront restaurant, serving lunch and dinner daily. Relax in the Jolly Roger's casual outdoor atmosphere and watch the fishing boats unload the day's catch next door at the Ocracoke Fish House. The April 2005 issue of Southern Living Magazine highlighted the Jolly Roger Pub & Marina as "Our Picks of the Best" and as the place to "enjoy stunning views and hearty fish sandwiches." Hosting live music around sunset most days of the week, the Jolly Roger is known as the locals’ place to go. Visiting Ocracoke for the day? Sail into the Jolly Roger Pub & Marina and tie up at the dock for lunch or dinner. 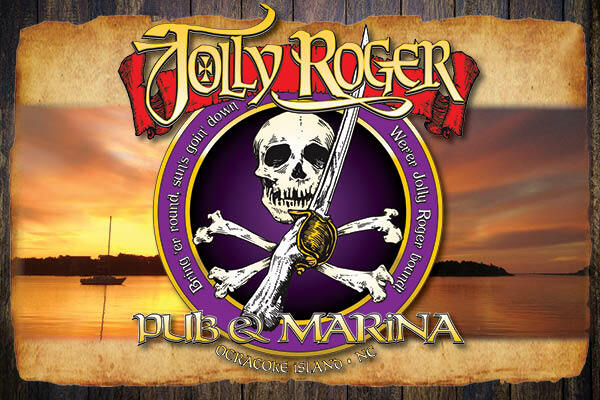 Deep water docking is available at the Jolly Roger, with nightly, seasonal or year-round rates. You can also check out the many vacation activities offered at the Jolly Roger marina, including parasail rides, Jet Ski rentals, fishing charters, and Portsmouth Island ATV tours!